SmartLooks Window & Wall Décor located in Richardson, Texas has been serving the Dallas, Texas area since 1972. We are the industry leader in window treatments for Dallas. You’ll be assured of the perfect start and finish to your window coverings project. Our installers are prompt, courteous, and helpful, and you’ll feel comfortable inviting them into your home. Custom window treatments provide the finishing touch for every room with the proper balance of design and functionality. Window treatments provide protection from the light, and soften the sounds in a room. 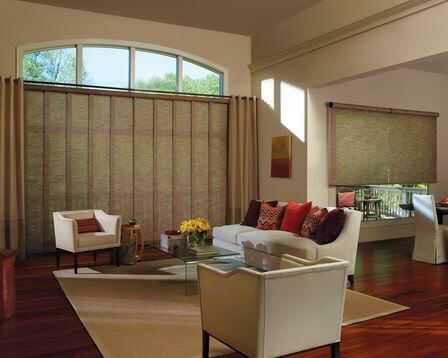 At SmartLooks we specialize in beautiful custom window treatments that will enhance the appearance of any room. Our experienced staff will help you find the perfect window treatments to coordinate with the style of your home. SmartLooks Window & Wall Décor provides Interior and Exterior Window Products for both Residential & Commercial Applications. Interior Window Treatments offer an aesthetic quality that enhances your home’s décor. Featuring Cordless, Retracting Cords, Loop Cords, Motorized and Battery Operated Mechanisms, SmartLooks Window & Wall Décor offers a wide array of lifting system options for enhanced child and pet safety, as well as ease of operation. With over 45 years of experience, the expert window treatment and home design specialists at SmartLooks Window & Wall Décor can help you with a wide range of custom window treatment and home design needs. Whether you’re building a new home or remodeling, we can help you transform your home. Wood blinds, shutters, and more. Choosing the right window solution can be daunting, but our experienced design professionals will work with you to find a solution that enhances the look of your home while providing you the functionality you desire. Our experienced staff uses professional techniques and equipment on every measuring and installation project. Our experienced staff is fully trained to properly measure and install virtually any window covering and will help you reach your desired décor within your budget. To get started call us at (972) 699-1151 or stop by our retail store located at 101 S Greenville Ave, Richardson, TX.